(Cambridge, MA) Improv is a weird thing to have to review. You often can’t comment on the set, because the world and props within it are imaginary. The entire show is based on a singular experience that will never be repeated, and that relies heavily on the chemistry of the actors on stage. 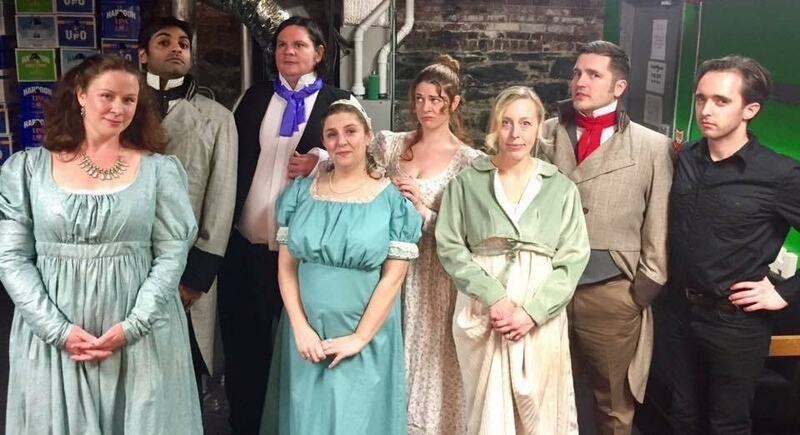 But I’m happy to report that chemistry in one of ImprovBoston’s productions of Wheel of Austen was well within the performers’ wheelhouse. Set within the literature of Jane Austen, a group of sisters, of various virtue and chastity, dote on the available men in their village. The suitors, a priest, a war-veteran-turned-tavern-owner, and a successful businessman, end up in a sticky spider web of love and confusion. Meanwhile, a widowed mother struggles to impart her wisdom in love and guidance upon her three daughters. So what’s the gag? Well, to shake things up for the actors on stage, an audience member is selected at random several times during the show to spin the Wheel of Austen. Possible happenings include, “A Gentleman’s Duel,” “A Secret Engagement,” and “Overhearing a Conversation Not Mean For You.” The actors must proceed with their next scene keeping this incident in mind, while still keeping the plot of the show in a forward motion. What’s really fantastic about good improvisational comedy is not only the creative wit it requires, but the amount of world building it forces the actors on stage to craft with the assistance of audience contribution; it truly is a collaboration between professional performers and the audience. And every actor on stage was willing to play along to keep the crowd giggling while still maintaining a coherent plot. From playing the cello to seduce a lover, to taming a wild jaguar, the actors made improv look easy, and they made courtship in the 18th century funny as hell. You certainly don’t have to be familiar with Austen’s work to appreciate the hilarity of this show. In fact, I have a personal hate-passion for her work, but still found it a damn delight. Actors in Wheel of Austen include Noah Sheola, Chris Bujold, Michelle Boncek, Benjamin Scurria, Elyse Schuerman, Paul Dome, Lisa Cordner, and Jenna O’Brien. Wheel of Austen runs for 75(ish) minutes with one intermission and plays every Friday night in March at 10:00pm. To purchase tickets, click here. This entry was posted in Improv and tagged 18th century, 2017, Benjamin Scurria, Cambridge, Chris Bujold, Elyse Schuerman, improv, ImprovBoston, Jane Austen, Jenna O'Brien, John Herman, Lisa Cordner, MA, March, Michelle Boncek, Mike Descoteaux, Noah Sheola, Paul Dome, Travis Manni, Wheel of Austen by Travis Manni. Bookmark the permalink.